a new mini-series, if you will. basically a picture round-up of the week. by no means will it be regular; my life right now consists of cooking/baking a lot of things that are tasty but not quite full post worthy, lying on the couch and working out (a tiny bit). these posts will be very infrequent when school starts because who gives a banana about sleeping and homework and not paying attention in class? for now, hello summer pics. continued my disney puzzle (it’s harder than it looks and there’s a ton of blue sky and i have no idea what to do with those pieces) and ate salad. i like to put a ton of random stuff in my salads/on my pizza; this one is kind of tame for me. 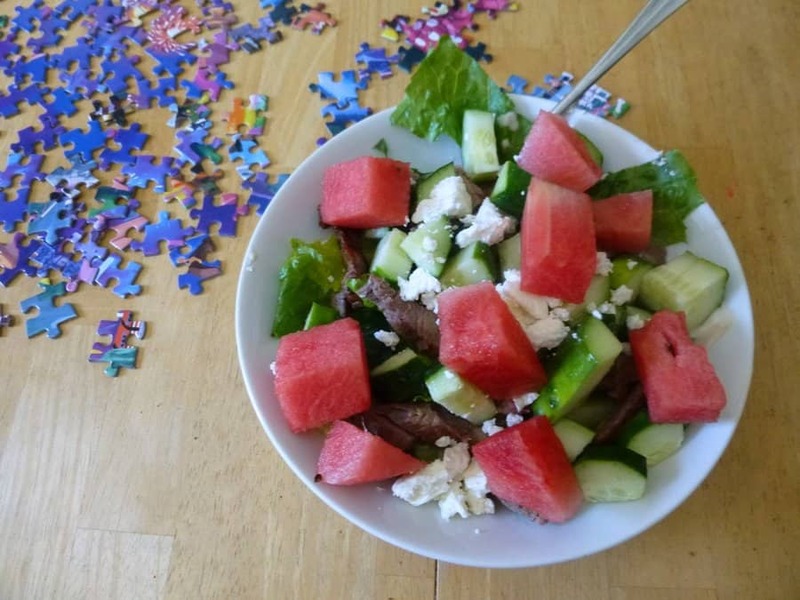 it has lettuce, leftover steak from when my dad made fajitas this week, cucumber, tofu cream i needed to use up from when i made this salad (which was really tasty, btw), crumbled feta and watermelon. recently started adding watermelon to salads and i’m definitely a fan. went to see 5sos!! i was on the lawn, so the “seats” (you bring your own blankets so you can sit on the grass) were cheap though a little far from the stage. hence, the big screen. i saw them in la last nov, and the set lists were similar, except they played two of their new songs this time around. they sounded more on point musically this time, but they also didn’t talk as much. they didn’t seem as appreciative or interested or genuine. i still loved them banana-loads. thanks! it was even better with another cucumber chopped up and added (somehow it got more garlicky as it rested longer).